Celebrating International Pi Day with Pie and Yay! Happy Pi Day Everyone! Yes, it is once again time to celebrate 3.14-ish as today is 3/14 in the calendar. Let’s get jiggy with it! In celebration of this significant holiday, today we will be celebrating funny things in mathematics and pie. Buckle up, Jimmy! First, we go to ABC News, who have used their decades of experience and status as a trusted news source to tell us that Einstein Bros. are offering a free salmon sandwich to anyone who purchases one. That is, it’s a buy one, get one free type deal, not a “this is a free thing you get as long as you pay for it” deal, which isn’t a deal at all really, it’s just commerce. So don’t be fooled by that one folks! This report is included in their “Pi Day Deals” article, though I don’t know anyone who would consider salmon sandwiches pie, so what in the world, ABC News? What in the world? 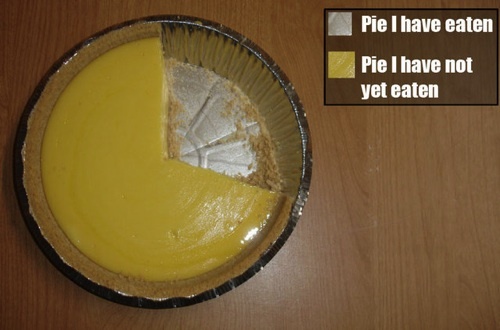 This is my favorite pie chart. Also totally mathematically accurate. Moving on to actual math, we have important news from New Zealand, where scientists have discovered that the game Candy Crush is really, really hard. Keep on working down there, researchers. This is important stuff. More mathiness comes from Cornell mathematician Daina Taimina, to whom beautiful math results “sound like a melody”. To me math always sounded like rusty gears grinding to a halt in my head while a chubby angel laughed cruelly into my ears, but that might just be me. All kinds of funny named math successes contributed to that above article, including Semir Zeki, and Bevil Conway. Great piece actually, if you’re interested in what makes math folks tick. In India, Professor Conjeevaram Srirangachari Seshadri turned 82 a few weeks ago and is still going strong in the world of mathematics. This guy is such a badass, Pi Day celebrates him. Go Conjeevaram! To finish off, if you want to celebrate Pi Day in style, by which I mean eating strange kinds of pie, then this website is for you! From Dorito and Onion to Cheeseburger Pickle, these are the kinds of combinations only the most dedicated and the most drunk will ever attempt to eat. Good luck. This entry was posted in Uncategorized and tagged funny, humor, math, pi, pie. Bookmark the permalink. 13 Responses to Celebrating International Pi Day with Pie and Yay! You have vexed me with this salmon sandwich issue. I almost want to drive down to Einstein Brothers to see what’s up, but since their bagel is like $5, I imagine the sandwich would be $10 anyway. In these parts, Frito Pie is often on the menu, so I’m sure some folks will be pouring chili, cheese and onions into bags of Fritos today to celebrate their anti-veganism. Also, I find myself having to take a deep breath before pronouncing Conjeevaram, which sounds like an inflammation of the cornea or something. Conjeevaram. Yes, it kind of a works as its own mantra. You must take a deep breath and you can only focus on the sounds as you make them, otherwise you will end up saying something completely different. Frito Pie, eh? Sounds exotic. Definitely something invented at 3am. We need to send an investigator to get to the bottom of this salmon sandwich business. The interweb says they are pies of the sea. What? Does that make a BLT a pie of the farm? Where can I get a BOGO BLT? The interweb thingee also says that July 22 is the other Pi Day. Is it because July 22 marks the point where the other side of that Pac Man mouth intersects with the edge of the pie pan? This is my favorite book with Pi in the title. It’s actually really good! My, that book actually looks rather interesting. Good title too. There are TWO pie days? Man, talk about having your pi and eating it too. Hahaha, that is a fantastic chart. Perhaps my favorite Meat Loaf (or meat loaf for that matter) related chart. Got any special pies ala those recipes cooking today? I might tackle the vinegar pie–could be yum? Ooh, sherry marshmallow pie sounds like something everyone would enjoy. Vinegar pie – I’ve heard of stranger things called pie (in a land called Britain where anything goes in a pie) but that would could work. i love your pie chart, it is perfect. I want to be drunk enough to eat all of those concoctions! Yay! Maybe we can get drunk on an Arto’s Igloo drink from Liz’s blog! You can tell I had a crazy day when I didn’t get to read FNITN until after midnight! Yikes! Yesiree Bob! Just rereading this, since my weekend started a few hours ago. Thanks for the heads up… I will not fall for a “get one free as long as you pay for it” deal ever again!